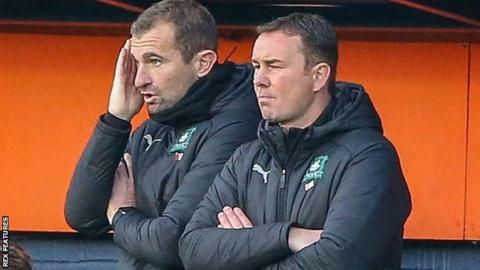 Plymouth Argyle manager Derek Adams says he will strengthen his squad in January following their 5-1 drubbing at Luton Town in League One. The loss was the third time this season the Pilgrims have conceded five goals, and they are 22nd in the table with only three wins from 18 games. "Of course we need to strengthen," 43-year-old Adams told BBC Radio Devon. "There are players that will have to move on in January for new players to come in, and that's only natural." Adams and his backroom team have already begun identifying players that will boost the squad when the transfer window re-opens on 1 January. "Planning is in place, we're trying to get players in," he added. "We have to identify players, which we have done, but that all comes from players that are with clubs and it takes time."